Here in southern Ontario Mother Nature gave us one final blast of winter last week. Her final salute to winter came complete with sub-zero temperatures. That’s okay though, because we know the calendar says it is finally Spring, and since the beginning of time, Spring has always arrived. This week it has finally happened. The sun has been shining, and warmer days are here. Spring life is beginning to awaken. Daffodils and crocuses have bravely poked their green heads out of the earth. Buds will soon be bursting on tree branches, and you can truly feel the beginning of life happening again. 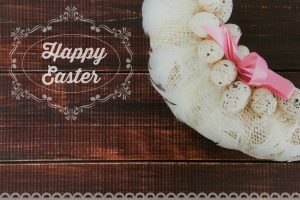 On the celebration calendar this yearly renewal means Easter, and celebrating the season of rebirth with family and friends. However you choose to celebrate Easter; whether you cook yourself, you participate in a pot luck, you dine in a restaurant, or you hire a chef, the most important part of the Easter celebration is that all the knees of your loved ones are under one table. Do you prefer an Easter Brunch or an Easter Dinner for your main feast? At our house, brunch is the way to go at Easter. Here is the logic; Easter means eggs, and eggs mean brunch. Simple. Besides, brunch truly is a meal that can last all day and include many different types of food. Add some sparkle. The form your sparkle takes is up to you. 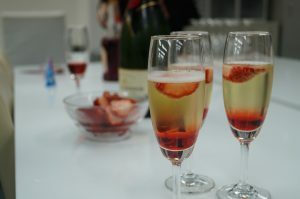 Sparkling water with fresh fruit, juice and soda water, or even champagne can all add a certain elegance to Easter brunch. Warm the plates. This one simple little step will definitely elevate your Easter brunch, and happens to be a favourite element to any special dinner at my house. Plus, it will keep hot food hot longer. Use a side plate for cold food. Keep it simple. Remember that elevating Easter brunch doesn’t have to mean it’s more complicated. Being present for your family and friends is what is most important, so make things easier for yourself as the host. Do as much preparation ahead of time as you can. Slice and serve is a good way to go. Dishes that are cooked ahead of time and just need to be warmed and then taken out of the oven just before your meal. Bake the quiche on a pan in the preheated oven for 60-70 minutes or until an inserted knife comes out clean. Allow the quiche to sit for 10-15 minutes before cutting. 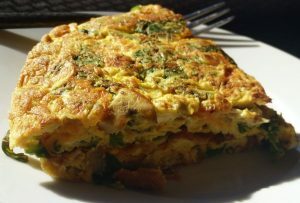 This can be made a day or two ahead and wrapped and stored in the fridge until the day of your brunch. Enjoy this delicious quiche with a mixed green salad, some fresh fruit, and other Easter brunch delicacies. If DIY is not your thing this Easter, please reach out to inquire about hiring a personal chef from manjya. Oh, and don’t forget the chocolate. Easter should include lots of chocolate.